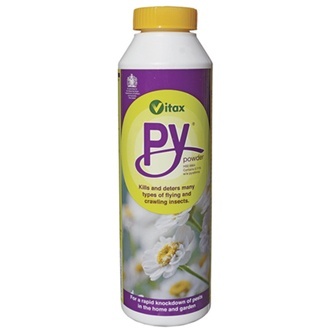 Based on pyrethrum, nature's own insecticide, Py Bug Killer Powder controls greenfly, weevils, flea beetles, moths, silverfish and caterpillars. It will also kill fleas on pet bedding. For use on hard, porous and non-porous surfaces, hard and soft furnishings, in sheds, garages, paths, ant nests and refuse tips. Contains pyrethrins.